You can practice Irregular Past Tense Verbs by reading about American Immigration History. Instructions: Use the correct forms of these irregular past tense verbs to fill in the blanks in this story on immigration. The present tense form of each verb is given in italics inside parentheses ( ) after each blank. For the actual paragraph 1 below, write: "1. was, heard." If you would like to print this exercise and work offline, click here for a pdf version. 2. The Spanish _______ (take) advantage of the discovery immediately. During the next century they _______ (find) and _______ (fight) with the greatest nations of the Americas and conquered them. By 1600 they _______ (have) profitable colonies in Mexico, Peru, and the Caribbean. 3. The English _______ (begin) permanent settlements in the Americas more than a century after the Spanish, starting with Jamestown in 1607. In 1620-21, the local Indians helped the Pilgrims survive their difficult first year in New England. That story of cooperation ______ (be-singular) one of the few bright moments in a long history of conflict between the English settlers and the native American tribes. 4. 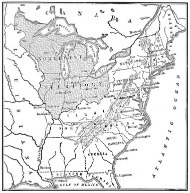 During the 17th and 18th centuries (1607-1775), 13 English colonies _______ (be- plural) established in the area that ________ (become) the United States. People _______ (come) to the colonies from England and Scotland, as well as from France, Germany, and other parts of Europe. 5. In addition, slave traders ________ (bring) many Africans to work the land as slaves. Slaves ______ (be- plural) ________ (buy) and _______ (sell) in the U.S. until the 1860s, although many Americans opposed slavery. 6. The British government ______ (do) not want the colonies to expand to the west. In part, it ______ (be- singular) trying to protect the Indians. Legal limits _____ (do) not stop the land-hungry settlers, however. Before the American Revolution as well as after, many hunters, trappers, and then settlers, _______ (go) west looking for opportunity. 7. After the U.S. ______ (win) its independence, it ______ (grow) even more rapidly. In 1803 the U.S. _______ (buy) the Louisiana Territory from France and doubled in size. More immigrants _______ (come) to the U.S. from all over Europe. 8. In 1848 a famine in Ireland and turmoil in Germany _______ (send) many people to the U.S. Others _______ (leave) Scandinavia to work in the Midwest as farmers or loggers. Irish and Chinese laborers ________ (build) the transcontinental railroad that ______ (make) travel to California easier. 9. Immigrants _______ (bring) their own customs to the U.S. They _____ (eat) the foods they ______ (be- plural) familiar with, _______ (speak) their own languages, and ______ (keep) the traditions of their homeland alive. 10. Over time, though, they ______ (begin) to learn English and share their customs and foods with their neighbors. Different regions of the U.S. have different preferences in food and customs partly because of the different immigrants who ______ (come) to each part. American culture is richer because of contributions from many nations. 11. As American industry ______ (grow), factories needed workers. In the late 19th century steamships ______ (bring) many people to New York from Italy, Russia, Poland, and other parts of southern and eastern Europe. They _______ (find) work in many parts of the country. Many saved their money and soon started their own businesses or farms. 12. There ______ (be-plural) Spanish-speaking people in the Southwest long before the U.S. ______ (win) the war of 1848 and ______ (take) over California and the Southwest from Mexico. 13. Other Mexicans ______ (come) to the western states to work early in the 20th century, and still others _______ (be- plural) refugees from the violence of the Mexican Revolution. More refugees _______ (leave) Europe and Asia after the two world wars and the war in Vietnam. 14. Immigration continues today, as people from many parts of the world seek opportunity and the U.S. needs more highly-trained professionals in certain industries, as well as people willing to do hard physical farm labor and other jobs most Americans don’t want. 15. Americans have _____ (have) mixed feelings toward immigration from the beginning. Some have welcomed the hard work and contributions immigrants have _______ (bring). Others have feared immigrants’ cultures or their competition. However, no one can say immigration _____ (do) not matter. The United States truly is “a nation of immigrants. This essay has given a very brief, incomplete history of U.S. growth and immigration. Could you understand the story? Did you learn anything new? Could you remember the correct forms of the irregular past tense verbs? If not, check out Past Tense Irregular Verbs. The lists of irregular past tense verbs there are organized to make it easier to memorize them. I hope they help! Click here for Answers to Practice with Irregular Past Tense Verbs.